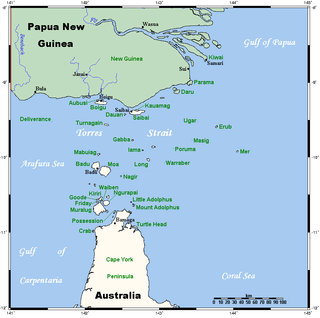 The Torres Strait (/ˈtɒrɪs/) is a strait which lies between Australia and the Melanesian island of New Guinea. It is approximately 150 km (93 mi) wide at its narrowest extent. To the south is Cape York Peninsula, the northernmost extremity of the Australian mainland. To the north is the Western Province of Papua New Guinea. It is named after navigator Luís Vaz de Torres, who passed through the Strait in 1606. The strait links the Coral Sea to the east with the Arafura Sea and Gulf of Carpentaria in the west. Although it is an important international sea lane, it is very shallow (7 to 15 m water depth), and the maze of reefs and islands can make it hazardous to navigate. In the south the Endeavour Strait is located between Prince of Wales Island (Muralug) and the mainland. Shipping enters Torres Strait via the Adolphus Channel which joins to the Great Barrier Reef lagoon to the southeast. Strong tidal currents occur in the narrow channels between islands and reefs, and large submarine sand dunes migrate across the seafloor. Some 580 coral reefs, including the Warrior Reefs and Eastern Patch Reefs, cover a total area of 2,400 km2 (930 sq mi) in the region, as well as some of the most extensive seagrass beds in the world. Several clusters of islands lie in the Strait, collectively called the Torres Strait Islands. There are at least 274 of these islands, of which 17 have present-day permanent settlements. Over 6,800 Torres Strait Islanders live on the Islands and 42,000 live on the mainland. These islands have a variety of topographies, ecosystems and formation history. Several of those closest to the New Guinea coastline are low-lying, formed by alluvial sedimentary deposits borne by the outflow of the local rivers into the sea. Many of the western islands are hilly and steep, formed mainly of granite, and are peaks of the northernmost extension of the Great Dividing Range now turned into islands when sea levels rose at the end of the last ice age. The central islands are predominantly coral cays, and those of the east are of volcanic origins. The islands are considered Australian territory and are administered from Thursday Island. There are several major policy and institutional frameworks in the Torres Strait region that support the sustainable use and management of marine resources while also protecting habitats, biodiversity and the traditional islander way of life. Most important of these is the Torres Strait Treaty entered into by Australia and Papua New Guinea in February 1985. The Treaty defines sovereignty and maritime boundaries in the area between the two countries. It guides decision makers on protecting the way of life and livelihood of traditional inhabitants, on managing the protection of habitats, and on sharing the commercial and traditional fisheries resources. The Treaty established a Torres Strait Protected Zone within which both nations manage access to fisheries resources. Each country exercises sovereign jurisdiction for resources on either side of the agreed jurisdiction lines. The islands' indigenous inhabitants are the Torres Strait Islanders, who are distinct from both the Papuans of adjoining New Guinea and from Aboriginal groups on the nearby Australian mainland but related to both. The various Torres Strait Islander communities have a unique culture and long-standing history with the islands and nearby coastlines. Their maritime-based trade and interactions with the Papuans to the north and the Australian Aboriginal communities have maintained a steady cultural diffusion between the three societal groups, dating back thousands of years at least. Two indigenous languages are spoken on the Torres Strait Islands: Kala Lagaw Ya/Kalaw Kawaw Ya/Kawalgau Ya/Muwalgau Ya/Kulkalgau Ya, and Miriam Mir, as well as Brokan [Broken], otherwise called Torres Strait Creole. In the 2001 Australian national census, the population of the islands was recorded as 8,089, though many more live outside of Torres Strait in Australia. Environmental issues facing the region include the risk of mining waste from the Fly River in southern Papua New Guinea, the impacts of global climate change and the sustainable management of natural resources. The islands of the Torres Strait have been inhabited for at least 2,500 years and possibly much longer. The first recorded European navigation of the strait was by Luís Vaz de Torres, a pilot who was second-in-command on the Spanish expedition led by navigator Pedro Fernandes de Queirós who sailed from Peru to the South Pacific in 1605. After Queirós's ship returned to Mexico, Torres resumed the intended voyage to Manila via the Maluku Islands. He sailed along the south coast of New Guinea, and may also have sighted the northernmost extremity of the Australian mainland, however no specific records exist that indicate he did so. In 1769 the Scottish geographer Alexander Dalrymple, whilst translating some Spanish documents captured in the Philippines in 1762, had found Luís Vaz de Torres' testimony proving a passage south of New Guinea now known as Torres Strait. This discovery led Dalrymple to publish the Historical Collection of the Several Voyages and Discoveries in the South Pacific Ocean in 1770–1771, which aroused widespread interest in his claim of the existence of an unknown continent. It was Dalrymple who named the strait after Torres. Dalrymple was bitterly disappointed that it was James Cook and not he who was appointed commander of the expedition that eventually led in 1770 to the British encounter and charting of the eastern coastline of Australia. In 1770 Lieutenant James Cook rounded Cape York, turned south-west and landed on Possession Island. From the top of a hill, he signalled down to the ship that he could see a navigable passage through the dangerous Strait. Later in Batavia, where he learnt that the French had preceded him across the Pacific, Cook re-wrote this signalling drill as a possession ceremony , saying he had claimed Australia's east coast for the British Crown. In 1823 Captain John Lihou, Master of the 550-ton merchant ship Zenobia of Calcutta, was on passage from Manila to South America and chose a route through Torres Strait. Remarkably, this would become the first time for a ship to be navigated through the Torres Strait from west to east. According to the Sydney Gazette of April 1823: 'This essay of nautical skill was accomplished after the loss of four anchors and the rudder.' It was also the first occasion a ship was navigated through the Coral Sea from Torres Strait, south-eastward to the southward of New Caledonia. Lihou saw Sir James Saumarez' Shoal (now Saumarez Reefs) on 27 February and named the reef system after Vice-Admiral James Saumarez. On this same trip, Lihou discovered the Lihou Reef and Cays and Port Lihou (originally named Port Yarborough, on the southern shore of Prince of Wales Island). Please note that Lihou's ship should not be confused with the 385-ton HMS Zenobia, built at Kings Lynn in 1807. The London Missionary Society arrived on Erub (Darnley Island) in 1871. Although some of the Torres Strait islands lie just off the coast of New Guinea, they were annexed in 1879 by Queensland, then a British colony. There was an important pearling industry from the 1860s until about 1970 when it collapsed in the face of competition from the plastics industry. Pearl-shelling was responsible for the arrival of experienced divers from many countries, notably Japan. In 1978 an agreement between Australia and Papua New Guinea determined the maritime border in the Torres Strait. Torres Strait is mentioned in Jules Verne's Twenty Thousand Leagues Under the Sea as a dangerous strait where the submarine, the Nautilus, is briefly stranded. The people of the Torres Strait have a unique indigenous culture which has drawn the interest of a range of anthropological, historical, archaeological and folklorist researchers (both professional and amateur). This includes an expedition from Cambridge University led by the early ethnographer Alfred Haddon in 1898 and the more contemporary regional work of Australian anthropologist Jeremy Beckett. Accounts of local Indigenous narrative traditions can be found in the work of Nonie Sharp and Margaret Lawrie. Due to proximity to the Papua New Guinea mainland, the northern Torres Strait islands experience occasional asylum seeker arrivals from across the Strait. A total of ten asylum seekers from Papua New Guinea were detected in each of 2012 and 2013. In 2016 the Australian Federal Police were tipped off by residents of Prince of Wales Island that men from Sydney were attempting to buy a boat to reach Papua New Guinea in order to leave Australia without a passport. Endeavour Strait (purple line on chart) – for small vessels. Prince of Wales Channel: Larger ships transiting Torres Strait enter the Prince of Wales Channel from the West just north of Booby Island by way of the Gannet or Varzin Passages. The minimum depths for deep draught shipping in the Great Barrier Reef pilotage area are found here (10.3m – Nov 2011). Shipping with a 12.2m static draught or less are permitted to transit the area. Great North East Channel: East of Prince of Wales Channel at Wednesday Island the Route becomes The Great North East Channel (green line on chart). The Great North East Channel (GNEC) links the Prince of Wales Channel to the northernmost entrance to the Great Barrier Reef, 120 NM away at Bligh Entrance. The GNEC route runs North or South of Alert Patches and East to under Twin Island then Northeast to Dalrymple Island (the end of Pilotage requirement) then on to Bramble Quay, Bligh Entrance and the open sea. This passage routes shipping to the Coral Sea, the Pacific Ocean and the outside of the Great Barrier Reef. Another channel (brown line on chart) runs down towards Cape York. ^ John Burton. "History of Torres Strait to 1879 – a regional view". 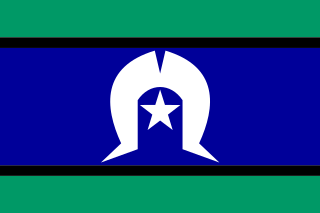 Torres Strait Regional Authority. Archived from the original on 2009-05-15. Retrieved 2008-04-13. ^ Beaglehole, J.C. (1955). The journasls of Captain James Cook, Vol. I. Cambridge: Hakluyt Society. p. 387-388. ISBN 0851157440. ^ Cameron-Ash, M. (2018). Lying for the Admiralty: Captain Cook's Endeavour Voyage. Sydney: Rosenberg. p. 180-189, 190-197. ISBN 9780648043966. ^ Ganter, Regina. (1994). The Pearl-Shellers of Torres Strait: Resource Use, Development and Decline, 1860s–1960s. Melbourne University Press. ISBN 0-522-84547-9.
for the agreement see "Treaty between Australia and the Independent State of Papua New Guinea concerning sovereignty and maritime boundaries in the area between the two countries, including the area known as Torres Strait, and related matters, 18 December 1978" (PDF). United Nations. Retrieved 2008-04-13. ^ Wordsworth, Matt (13 August 2013). "Torres Strait looms as a new route for asylum seekers escaping PNG". ABC News. Australian Broadcasting Corporation. Retrieved 9 May 2015. ^ "AFP probes men seeking boat in Torres Strait". 15 June 2016 – via Brisbane Times. Singe, John. (2003). My Island Home: A Torres Strait Memoir. University of Queensland Press. ISBN 0-7022-3305-6. Wikimedia Commons has media related to Torres Strait. Boigu Island is the most northerly inhabited island of Queensland and of Australia. It is part of the top-western group of the Torres Strait Islands, which lie in the Torres Strait separating Cape York Peninsula from the island of New Guinea. The mainland of Papua New Guinea is only 6 kilometres (3.7 mi) away from Boigu. Boigu has an area of 89.6 square kilometres (34.6 sq mi). Boigu is also the name of the town and Boigu Island is the name of the locality on the island within the Torres Strait Island Region. Booby Island is located 45 km (28 mi) northwest of Muttee Heads at the tip of Cape York Peninsula in Queensland, Australia. This island is in the Torres Strait, 32 km (20 mi) west of Thursday Island and 23 km (14 mi) west of Prince of Wales Island. Booby Island is also known as Ngiangu by the Kuarareg people of the western Torres Strait, its traditional owners, named for the giant Ngiangu who was forced from a neighbouring island It has been called Booby Island by a number of European explorers, including Captain Cook, for the presence of the Booby birds. Warul Kawa Indigenous Protected Area is a small island that is part of Australia's National Reserve System, located 34 kilometres (21 mi) south of Papua New Guinea and about 200 kilometres (120 mi) north of Thursday Island, Torres Strait. The protected area and island are the most north westerly of the Torres Strait Islands located in the water of Torres Strait, part of Queensland in Australia, and 74 kilometres (46 mi) from Indonesia, at the border of West Papua province. Port Lihou Island or Yeta is an island in the Torres Strait, in Queensland's north between the Australian mainland and Papua New Guinea. It lies off the south coast of Muralag, separated by a channel that is three kilometres long but only a few metres wide at the north-eastern end. It is approximately 2.8 by 2.8 km in size. The area is 3.97 square kilometres. Bramble Cay, also called Maizab Kaur, Massaramcoer or Baramaki, and located at the northeastern edge of the Torres Strait Islands of Queensland and at the northern end of the Great Barrier Reef, is the northernmost point of land of Australia. It is 55 kilometres (34 mi) southeast of the mouth of the Fly River of Papua New Guinea. Parama Island is an island close off the south coast of Papua New Guinea. It is located 17 km east of Daru, the provincial capital of Western Province, at the southernmost extreme of the Fly River delta, and at the northeastern corner of the Torres Strait. It is the northernmost of the Torres Strait Islands, and at the same time the southernmost of the Fly River delta. 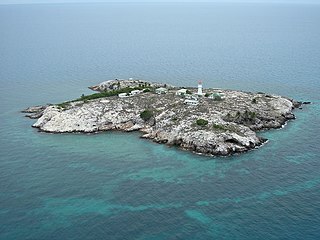 Bampton Point, its southernmost point, marks the southwestern corner of the Gulf of Papua. The Coral Sea is southeast. Torres Strait is south and southwest, specifically the Great Northeast Channel, which separates Parama Island from the closest Australian (Queensland) island, Bramble Cay, 48 km ESE. The Coral Sea Reserves Ramsar Site comprises the 17,292 km2 of oceanic island and reef habitats within the former Coringa-Herald National Nature Reserve and the former Lihou Reef National Nature Reserve in the Australian Coral Sea Islands Territory. The Adolphus Channel or the Albany passage is a channel located in the Torres Strait, situated northeast of the Cape York Peninsula, in Queensland, Australia. The channel runs north of the Albany Island, one of the islands if the Manar group of the Torres Strait Islands archipelago, and to the south of Mount Adolphus Island. Adolphus Channel is a major shipping route for traffic passing from the eastern coast of Australia to the Gulf of Carpentaria, Arafura Sea and regions further west. It is about 7 km across at its narrowest point, mostly less than about 20 m in depth and opens towards the west and towards the east. Submarine dunes up to 5 m tall migrate along the Adolphus Channel seabed, posing a potential risk to safe navigation. Holy Trinity Church is a heritage-listed Anglican church at Saibai Island, Torres Strait Island Region, Queensland, Australia. It was built from 1926 to 1938. It is also known as Holy Trinity Church of England. It was added to the Queensland Heritage Register on 21 October 1992. All Saints Anglican Church is a heritage-listed church at Darnley Island, Torres Strait Island Region, Queensland, Australia. It was built from 1919 to 1938. It was added to the Queensland Heritage Register on 21 October 1992.